A new era of Radio Industry, working in Multi-frequency with bi-directional transmission. JUUKO JK is the first remote control for industrial equipment that combines quality, reliability, safety and economy in one.Never been so accessible. JK Series is designed to simplify the work life of those who use it. Through the use of high technology, Juuko has significantly reduced its consumption of batteries, it works with simple alkaline batteries.Wide range of Receiver.The receivers are divided into three different types of size: H/HV – HS – HM.Which can be matched to any model of transmitter unit JK series.This allows to take full advantage of the high amount of available relay outputs.3 different sizes of receiver on 4 kind model for output characteristics, one for every need2 AA alkaline batteries for 300 hours of continuous transmissionEmergency STOP button on highly accessible, secure always on topSafety at the highest level. 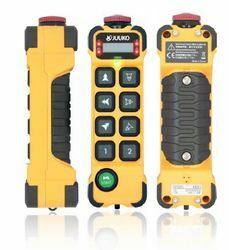 The transmission technology bi-directional radio allows a continuous exchange of data between transmitter and receiver, allowing a condition always optimal free working frequency and a high degree of safety.Start with an electronic key. To ensure access to use only authorized personnel without the need for keys removed, the start operation is under electronic key control that it is protected by password. L series is a high technology radio control equipment and it flexibility give a solution for every industrial application. Special functions are programmable by SOFTWARE available for customers. 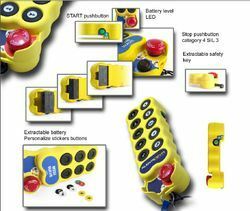 Push Button Remote COntrols for INdustrial and Crane Applications. LB series is a high technology radio control equipment and it flexibility give a solution for every industrial application. This kind of remote control is not suitable for Hoist machinery on CE area regulations. 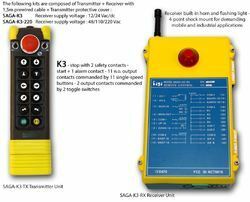 Saga V6 Radio Remote Control for Industrial Applications. 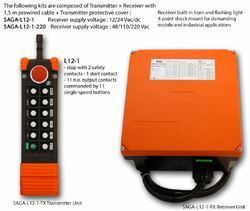 A new remote control for the "MobileIndustry"
Saga1 V6 is the new Radio Handheld Series SAGA to manage the various applications of radio controls onself-propelled vehicles. It is in fact designed to be installed in trucks and / or equipment for the industry where it is necessary tocontrol certain functions by radio control. 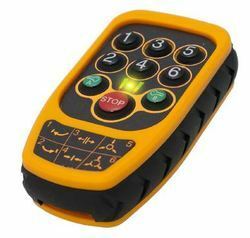 It is equipped with a rugged transmitter with a handy belt clip and a small size that easilyportability. The product works with 2 AA batteries to 1.5 VDC ensuring a long continuous transmission(button pressed) up to 150 hours. 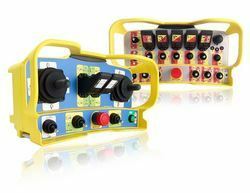 There are 2 differentreceivers, the standard model and the modelPLUS with additionalpush button retractablecontrol in an emergency or intandem with the transmitter. This option isespecially useful insituations of losing or failure of thetransmitter. L10 series is a high technology radio control equipment and it flexibility give a solution for every industrial application. L12 series is a high technology radio control equipment and it flexibility give a solution for every industrial application. Handy overall dimension (230 x 95 x 110 mm)High versatility of command5 steps speed joystickPractical belt bagProgrammable functional logicID remote settingHigh performance transmissionPurposely designed for the control of movable and industrial machineries, in the presence of high vibrations and heavy dutiesL40 series is a high technology radio control equipment and it flexibility give a solution for every industrial application. Also for Wave S, WAVE L focuses on ergonomics with a transmitter shaped according to the application needs: 25mm diameter motion buttons enabling easy use when wearing industrial gloves, mushroom head STOP button protected from falls. In addition, with M550D WAVE L10, are enables top level features. In fact this model is equipped with a LCD screen (two 8 character lines) for displaying machine feedback information. WAVE L is ideal for overhead cranes equipped with second hoist, grab, electromagnets, medium size tower cranes, etc. 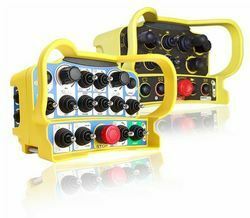 WAVE L transmitters are available with 10 and 12 double pressure motion buttons, they all feature a Start/Horn button, a mushroom head Stop button and removable "contactless" safety key for restricted operation as standard. Room for an optional rotary switch, push button, toggle switch or potentiometer is available. Stop ButtonIn CATEGORY 4 (UNI EN954-1) - provides maximum protection with a design based largely on concepts of regular monitoring and redundancy processes. ZEUS X is the answer to yourcustomization needs more extreme, if you need to combine the functionality of the joystick biaxial and uniaxial via remote control foryour application. Standard command on M550 transmitters for turning the radio system into working mode. Horn command is activated simultaneously to signal the machine is ready to operate. Forget expensive maintenance costs of traditional potentiometric joysticks! Thanks to the contactless sensing technology, M550 single and dual axis joysticks guarantee a long life and maintenance-free operation providing superb proportional and step control. Operated joystick radiocontrollers will then allow smooth and precise management of critical functions in a variety of industrial applications where a Human-Machine Interface is required. 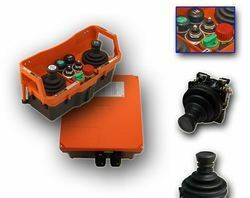 THOR X is able to offer customers a highly competitive choice for that special applications demanding for fingertip operation joysticks. Both single and dual axis joystick types can be mixed on the same dashboard allowing the benefits of an optimal control ergonomics. Forget the high maintenance costs of traditional joystick sliding contacts ! Thanks to modern technology-readable, single-axis joysticks all designed and produced for the series M550 will ensure a precision unmatched, able to create a feeling of tactile control of lifted objects that will continue throughout the life of your remote control. 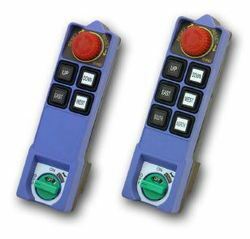 Importance of being first in active and passive safety M550 remote controls ensure the highest level of security, Category 4 (EN 954-1), thanks to a design widely based on the concepts of periodic monitoring and redundancy processes. Forget old metal keys subject to frequent breakage, rust, oxidation and jams. The new series of transmitters M550 offers a security key in magnetic contact that is the meticulous attention to detail in the design of products. The design is attention to every detail to provide a product ergonomic and functional. The end result is a compact transmitter with which are of comfortable and secure grip, comfortable for prolonged use. The M8 transmitter is designed for mounting on a DIN rail, and is the ideal solution for creating high-safety wireless link enabling the transmission of commands and status signals. This device should be mounted inside a control box for clean and trouble free installation, and is supplied complete with an external antenna for the radio communication. In addition to the 21 on/off + 4 proportional inputs, Start, Stop and Frequency Change features are available as for traditional radio control commands. The double transmission version can manage the feedback information displaying it on a LCD screen or activating some transmitter built in relays. Extractable terminal blocks with marker strips: order and simplicityA control box always kept in order, ease of access for maintenance purpose, quick installation: those are the main advantages deriving from extractable terminal block with marker strips you can find on M8 transmitter. The M8 transmitting unit supports the RS485 communication protocol that allows the data acquisition from sensors or external electronic devices. In order to simplify installation and maintenance procedures, M550 series has designed the electronic boards of its products keeping an easy access to the protection devices. External antenna with SMA plug: radio communication is guaranteedM8 transmitting unit communicates with its receiver thanks to an external antenna that can be easily mounted in the most suitable position for guaranteeing a reliable radio link. MAIN FEATURESThe STILO range of pushbutton stations for auxiliary circuits has been designed and produced in compliance with the safety criteria specified in the Europan Rules Machinery Directive EEC 89/392. The products are the result of years of experience and are specifically designed for heavy-duty as well as normal requirements. Types PKE are most suitable for building cranes while types PKP are for bridge cranes. They are available in versions containing from 4 to 14 buttons, size and inside space tested to allow fast cabling, thus reducing time and costs. SAFETY FUNCTIONINGThe emergency stop pushbutton, has been produced in compliance with Standard EN418 and the NC safety contact elements feature guaranteed opening (CEI EN 60947-5-1). A single internal membrane, separates the upper part from the bottom which contains the electric contacts, thus protecting from infiltration of water. All materials used, are resistant to atmospheric agents, temperature changes and shocks. Actuators, are marked with international symbols. Self-cleaning sliding contact elements in silver nickel alloy. 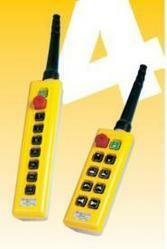 Looking for Crane and Industrial Remote Control Radio Frequency RF ?